A Guest Post by Adam Chilton and Mila Versteeg. The world’s constitutions have increasingly included commitments to protect social and economic rights. 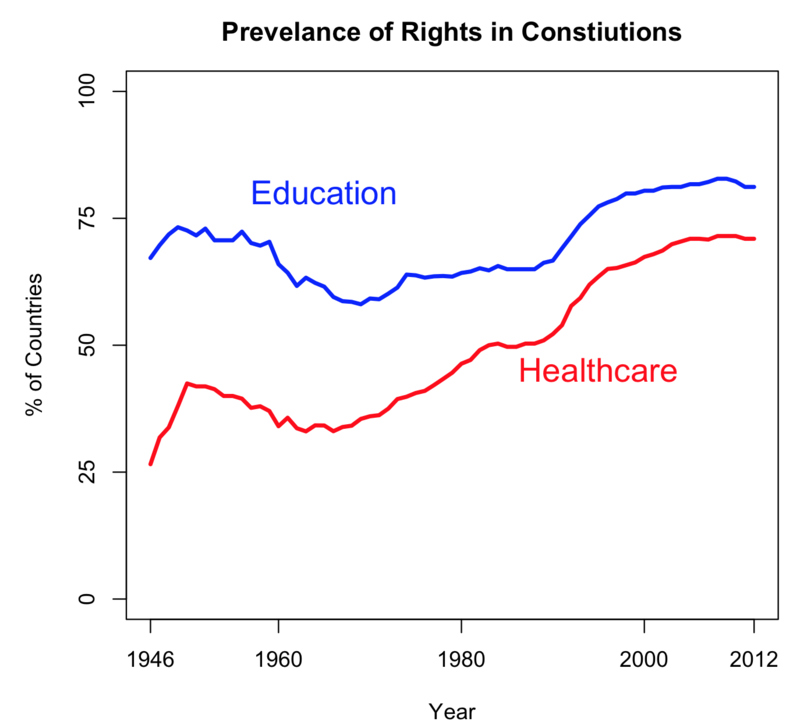 For example, as the figure above shows, by 2012 81 percent of all countries’ constitutions included the right to education and 71 percent protected access to healthcare. But little is known about whether these rights actually change how governments provide social services to their citizens. In a new paper on the topic, we empirically test whether the inclusion of the right to education and healthcare actually change either government spending or relevant outcomes like school enrollment or life expectancy. 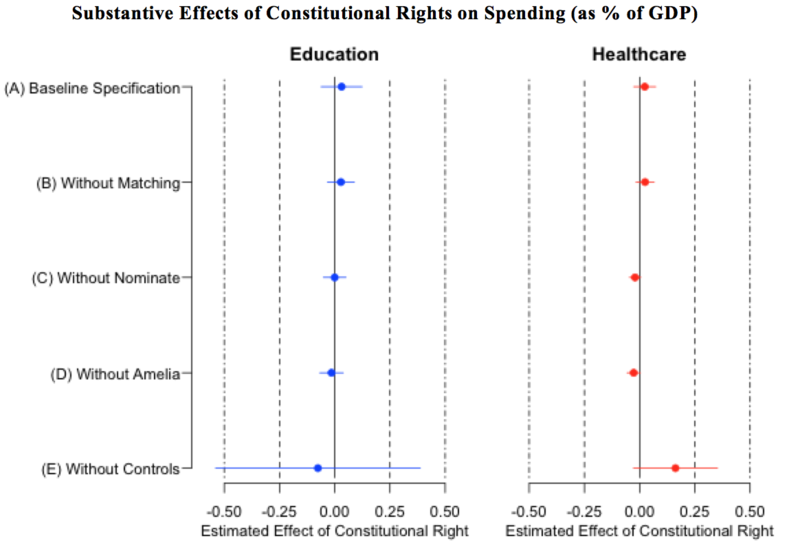 Using a variety of statistical approaches, we consistently find that these rights have no effect: the inclusion of these rights in constitutions are not associated with a statistically significant or substantively meaningful changes in government spending or outcomes. 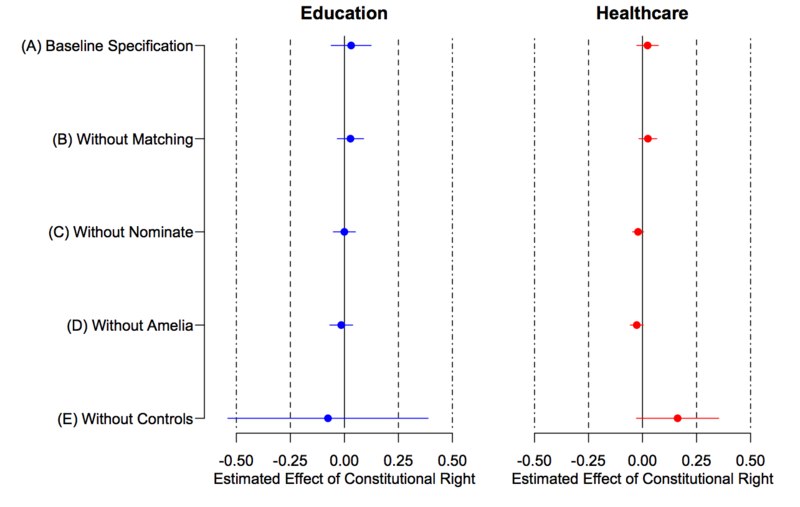 For example, the figure below shows our estimated effect size from several regressions estimating the relationship between a constitutional right to education and healthcare on the % of GDP that countries spend on education and healthcare. 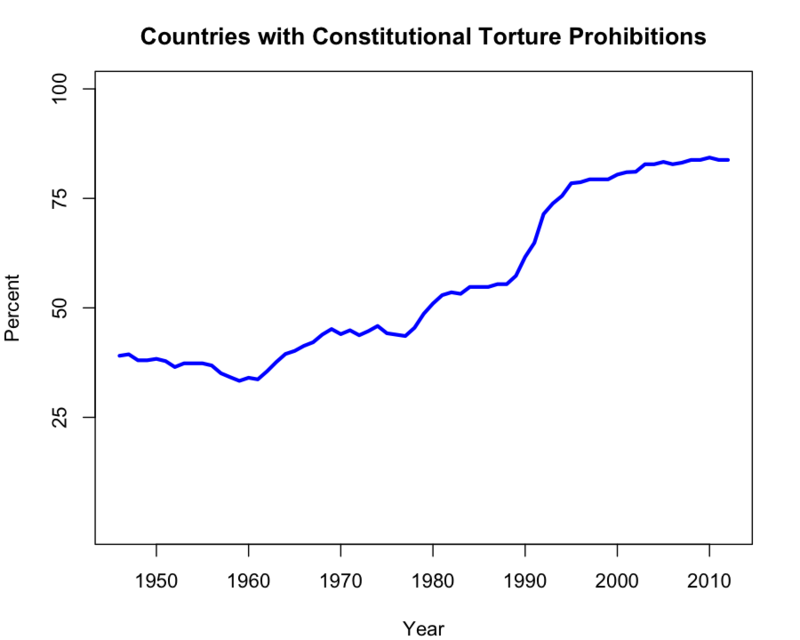 The figure shows a precisely estimated null effect. In other words, the results show that countries that adopt these rights do not change their spending on providing these rights at all. There’s a lot more, as well as the details on these regressions, in the paper. Are the number of women on a country’s Olympic team a good proxy for women’s rights in that country? Yesterday, Ryan Briggs–a political scientist at Virginia Tech–suggested the idea on Twitter and then decided to take a look at the data. 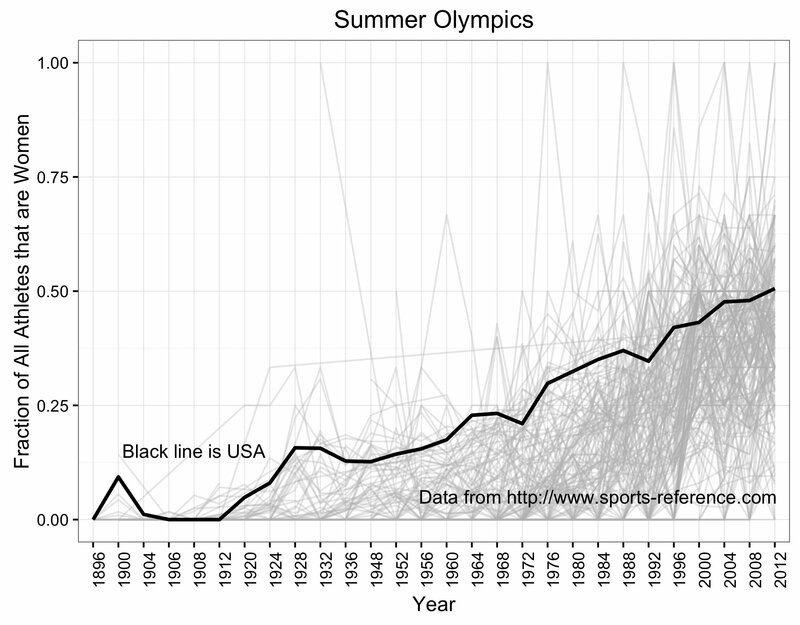 As Briggs’ above graph shows, the fraction of women on a country’s Olympic teams has clearly gone up over time. The relationship between women’s rights and Olympic participation, however, is less clear. 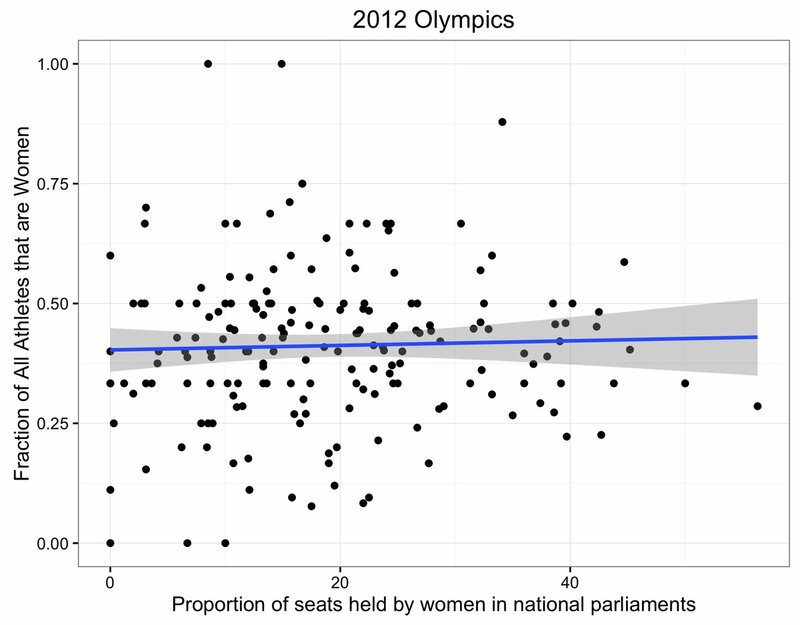 In the graph above, Briggs plotted the proportion of women in a county’s parliament against the fraction of women on the country’s Olympic team in 2012. Somewhat surprisingly, there is almost no correlation. To look into the data more, I decided to use some of Briggs’ code to scrape the data on Olympic participation and merge it with data from the Gender Equality Index (Eric and I have used this data previously to study the effectiveness of human rights treaties). The above graph shows my results. To be clear, these are just exploratory scatter plots that do not control for other variables, and more carefully analysis would have to be done before reaching any definitive conclusions. 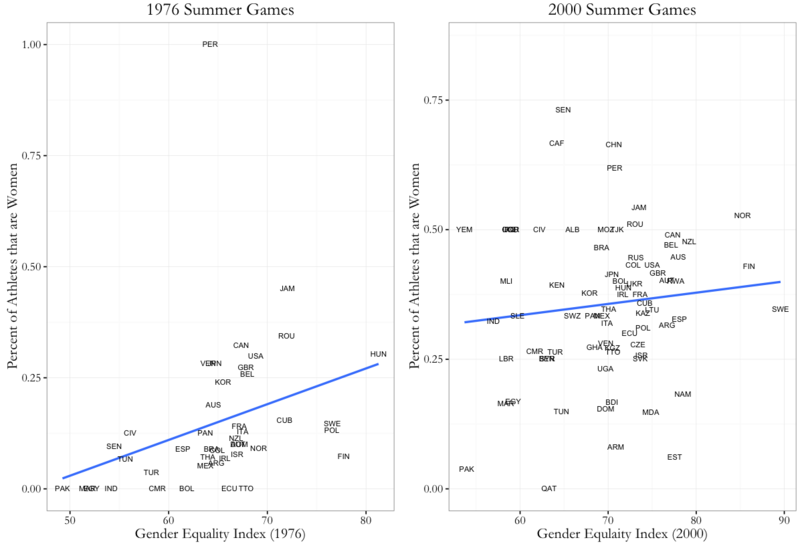 That said, the data seems to suggests that there used to be a fairly strong correlation between higher scores on the Gender Equality Index and women’s participation, but that over time countries have sent more women to the Olympics faster than they’ve improved their human rights. It’s an interesting question why countries with poor women’s rights records increasingly send as many women to the Olympics as countries with good records. If I had to speculate, I’d guess that these countries believe that the boost that Olympic medals provide to national pride is worth the costs of sending any athlete that qualifies to the Olympics regardless of gender. But whatever the reason, hopefully women’s Olympic participation will increasingly create pressure for countries to invest more in their women in other ways too. How can the distinctive methodology of law be pursued carefully and rigorously? Much of the core task of a lawyer, a judge, or a researcher amounts to assessing substantive legal materials, like constitutional provisions, legislation, or court decisions. But these materials are often canvassed and analyzed non-systematically. Although there are already extensive debates about how to interpret statutes or constitutional text or precedents, those debates tend to center on substantive disagreements about the legal effect of the provisions and not the more methodological question of *how* a given interpretive approach should be pursued. The academy can help by developing best practices for careful analysis. 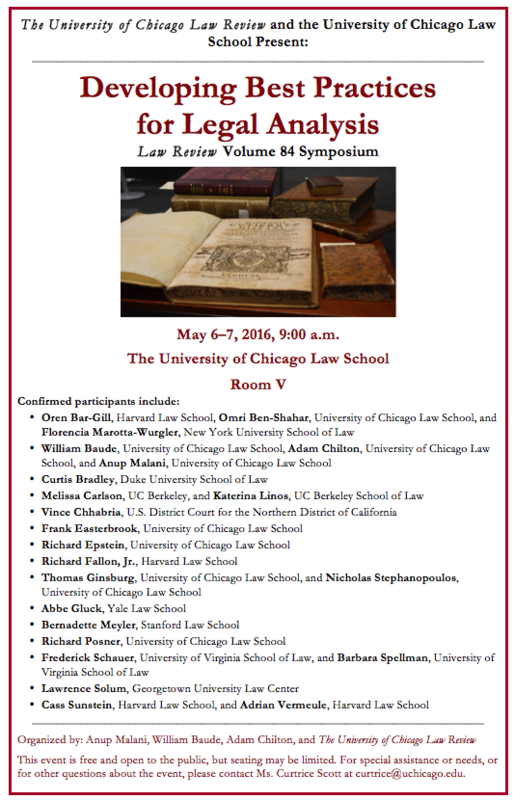 On May 6th-7th, the University of Chicago Law Review will bring scholars together for a symposium on this subject: Developing Best Practices for Legal Analysis. In addition to ourselves, the participants for the event include Oren Bar-Gill, Omri Ben-Shahar, Curtis Bradley, Melissa Carlson, Vince Chhabria, Frank Easterbrook, Richard Epstein, Richard Fallon, Tom Ginsburg, Abbe Gluck, Katerina Linos, Florencia Marotta-Wurgler, Bernadette Meyler, Richard Posner, Fred Schauer, Lawrence Solum, Barbara Spellman, Nick Stephanopolous, Cass Sunstein, and Adrian Vermeule. 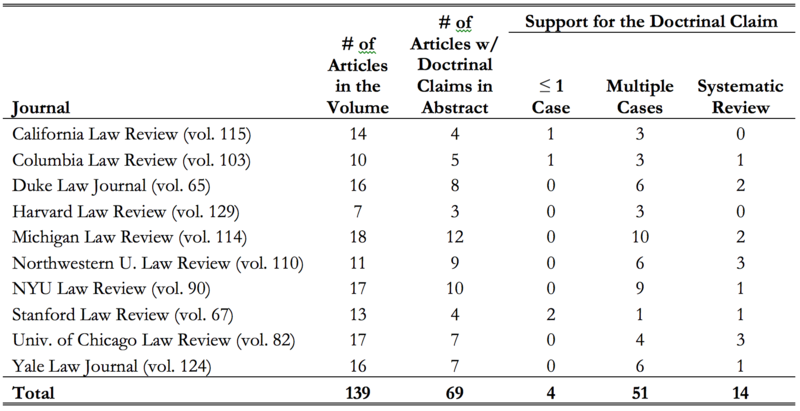 UCLA law professor Lynn LoPucki recently posted an article examining 120 empirical papers that were published in 15 leading law reviews and the Journal of Empirical Legal Studies. LoPucki coded these articles to see who was writing them, and what kind of data they used. The paper’s primary finding is that articles in the dataset written by law professors without a PhD were more likely than those with a PhD to code original data instead of using existing dataset sources. From this fact, LoPucki concludes that there is a “reduction in coding resulting from the hiring of more J.D.-Ph.D.s” that is undesirable for the legal academy. I have two thoughts about this interesting finding. First, I don’t think that we can infer from LoPucki’s paper that law professors with PhDs actually code less data. The reason is that LoPucki’s units of analysis are papers and not professors. It could be the case that law professors with PhDs code new data for a lower percent of their empirical articles, but still collect new data for a much higher absolute number of papers. LoPucki’s claim could be true–and I don’t have data to suggest otherwise–but I don’t think that it’s demonstrated in his current paper. Second, I’m not persuaded by the claim that the measure of a good empirical legal studies paper is whether it codes original data. To be fair, LoPucki’s argument is not that coding original data is necessarily important for all disciplines. Instead, his argument is that coding original data is important for legal scholarship because it typically requires direct engagement with legal materials like cases or statutes. I think that for all empirical papers–whether written by law professors or economics professors–the question of whether to collect original data or use existing data sources should depend entirely on what data are already available. For some topics it would be a waste of resources to reinvent the wheel, and for other topics collecting new data may be absolutely necessary. I think that an empirical legal paper is valuable if it credibly brings new evidence to an important topic, not if the dataset was coded specifically for the paper. When multi-member courts have to decide cases that involve multiple connected issues, the outcome of the case can change based on how the court counts the votes. This well documented phenomenon is known as the Doctrinal Paradox. Although it’s possible to explain the paradox more formally, it can easily be explained with a simple example borrowed from the philosopher Philip Pettit. In this case, there are two votes in favor of each sub-issue, but only one judge that thinks the defendant should be found liable. If the court counts the votes issue by issue, the defendant would be liable (this is known as “issue-based voting”). If the court instead goes with the overall votes of the judges, the defendant would not be liable (this is known as “outcome-based voting”). In these scenarios, how the case is resolved is entirely dependent on which aggregation method the court uses to count the votes. 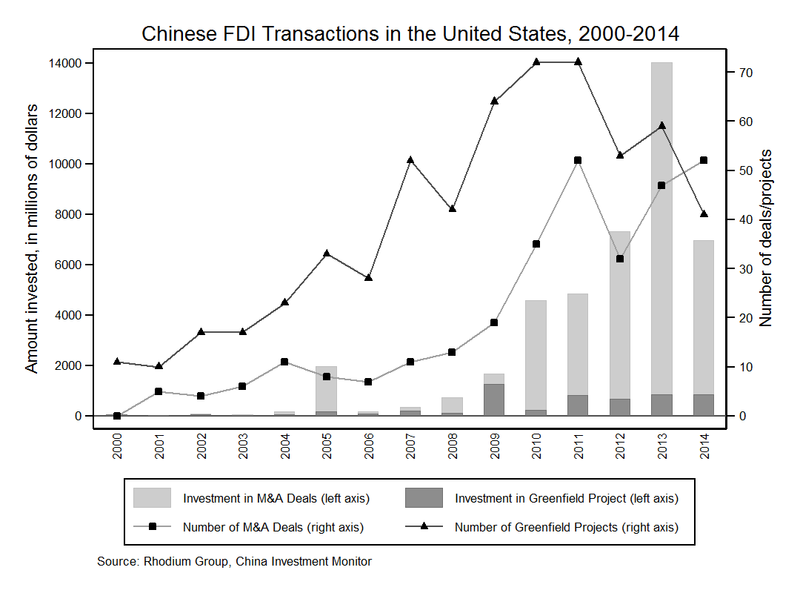 A few years ago, Dustin Tingley and I wrote a paper explaining that the conditions for the doctrinal paradox are increasingly present in international adjudication generally, and that this problem is likely to arise during international investment arbitration specifically. Although we were pretty confident that this was an issue that investment arbitrators would eventually have to resolve, we weren’t sure which aggregation rule would prevail. Dustin and I were just notified that a doctrinal paradox has recently occurred in an international investment arbitration, and that our analysis was brought up in the proceedings. In Alapli Elektrik B.V. v. Republic of Turkey, the arbitrators had to decide whether they had jurisdiction to hear the case. The facts of the dispute are complicated, but essentially there were multiple arguments made by the defendant for why the panel did not have jurisdiction to resolve the case. One of the arbitrators disagreed with every one of the defendant’s jurisdiction arguments, and thus thought that the panel had jurisdiction. The other two arbitrators concluded that the panel did not have jurisdiction to hear the case, but they reached that conclusion for different reasons. Given this distribution of votes, issue-based voting would result in a finding that the panel had jurisdiction, but outcome-based voting would result in a finding against jurisdiction. Alapli Elektrik B.V. v. Republic of Turkey demonstrates that the choice of aggregation rule can change the outcome of international adjudications. Ultimately, the panel elected to go with outcome-based voting (a decision that was affirmed during an annulment proceeding), but this isn’t binding on all future international courts or even investment arbitrations. There are principled reasons for selecting either aggregation rule, and it might be worth the time of scholars to debate which method is most appropriate for international adjudications. If you want to learn more, our paper is on SSRN and the annulment decision is publicly available here. Evelyn Blacklock, a student at Harvard Law School, writes in with these insightful comments on statutory interpretation in King v. Burwell. Although it involves a complex statutory scheme, King v. Burwell asks the Court to answer a relatively straightforward question: is the IRS’s interpretation of the ACA reasonable? The Court’s task is to identify the statute’s range of reasonable interpretations and determine whether the IRS’s interpretation falls within that range. If it does, the IRS wins, even if the Court thinks it is a second-best interpretation. As many have noted, King will therefore test the Court’s approach to contextual interpretation. To identify the statute’s range of reasonable interpretations, the Court must consider the contested provision, § 36B, “both on its own and in relation to the ACA’s interconnected provisions and overall structure so as to interpret the Act, if possible, ‘as a symmetrical and coherent scheme.’” So much is not controversial. The real question is how the Court will use context. As the lower court opinions demonstrated, there are different ways to approach contextual interpretation. One way is to consider how the relevant context might inform the meaning of the contested provision. The Fourth Circuit in King v. Burwell took this approach: the court admitted that a “literal reading” of § 36B seemed to favor the challengers’ interpretation (limiting tax credits to state Exchanges), but it also examined related provisions to see if they “shed any more light” on the question. Both § 36B(f), the “reporting” provision, and section 1312, the “qualified individuals” provision, seemed to assume that tax credits would be available on state and federal Exchanges. Given those and other contextual signals, King concluded that the IRS’s interpretation—allowing tax credits on both kinds of Exchanges—fell within the statute’s range of reasonable interpretations. The D.C. Circuit in Halbig v. Burwell, meanwhile, took a different approach. The court considered the same context, but inverted the inquiry: rather than ask whether context “shed any more light” on § 36B, Halbig asked whether the literal reading of § 36B—limiting tax credits to state Exchanges—would render those other provisions, which arguably assumed the availability of credits on federal Exchanges, absurd. The court concluded that the challengers’ reading might render related provisions odd, but not utterly absurd, and rejected the IRS’s interpretation. Halbig’s approach seems a strange way to go about determining interpretive reasonableness. As a (very simplified) example, suppose I live in an interpretive community where “milk” usually means “whole milk.” I have a recipe that calls for “milk.” It so happens that this recipe appears in a cookbook of low-fat recipes. I interpret this particular recipe as calling for “skim milk.” Is my interpretation reasonable? To answer that question, it would be natural to consider whether the rest of the cookbook seems to assume the use of low-fat ingredients; that contextual information might not be conclusive evidence of the meaning of “milk,” but it would surely be a point in favor of the reasonableness of my interpretation. It would be odd, on the other hand, to gauge the reasonableness of my interpretation by starting with the assumption that “milk” must mean “whole milk” unless that reading would render the rest of the cookbook absurd. The first approach uses context to determine whether my interpretation might fall within the total set of all reasonable interpretations; the second instead uses context only to confirm that a presumptively ideal interpretation is not unreasonable. The second approach actually tells us nothing about whether my interpretation is reasonable—it tells us only that at least one other interpretation is acceptable. Put another way, rather than use statutory context to test the reasonableness of the IRS’s interpretation, Halbig found a point estimate of statutory meaning and then effectively imposed a presumption against finding any wider range of reasonable interpretations beyond that point unless outright absurdity resulted. As the government put it in its petition for rehearing en banc, “‘absurdity’ was the wrong test. The majority erred by purporting to discern the plain meaning of one provision before considering all relevant provisions of the Act.” (Or as a recent brief noted: “[C]ourts must interpret a provision in the first instance in light [of] its context and place in the statutory scheme. . . . [T]he question here isn’t just whether Petitioners’ reading of Section 36B renders absurd the various [related] provisions . . . . Rather, the question is this: What does the ACA, read as a whole, say about tax credits when you take into account all its provisions?”) Halbig’s approach shifts the inquiry from whether there is a range of reasonable interpretations to whether the court’s initially favored interpretation—what it perhaps sees as the best interpretation—makes the rest of the statute unreasonable. So long as it doesn’t, the court’s interpretation wins. The court will not accept second-best, but still reasonable, interpretations unless the agency can rebut a presumption in favor of the court’s point estimate by clearing absurdity doctrine’s high bar. None of this is to suggest that the statute is simple or that the IRS must necessarily win. The suggestion, rather, is that when courts face a question of interpretive reasonableness, and when reasonable meaning depends on context, courts should not short-circuit the inquiry by examining context only after establishing a preferred interpretation, and then only in order to gut check that preferred interpretation. Discretion to make political or legal decisions is frequently given to one branch of government based on the belief that it is better suited to make a particular kind of decision than another branch. For example, much of administrative law is premised on the idea that administrative agencies are better positioned to make decisions about how to carry out their missions than judges. When these claims of comparative institutional competence are made, however, they are rarely based on systematic empirical evidence. This is in part because there are rarely opportunities to evaluate what happens when two different branches of government are tasked with making the kind of decision. In a paper published last week, Foreign Sovereign Immunity and Comparative Institutional Competence, we empirically evaluate one comparative institutional competence claim by taking advantage of a situation where Congress moved the authority to make a certain kind of decision from the State Department to the courts. That situation was created by the passage of the Foreign Sovereign Immunities Act (FSIA) of 1976. There is a longstanding principle of customary international law that governments should not be subject to suit in the courts of a foreign country. 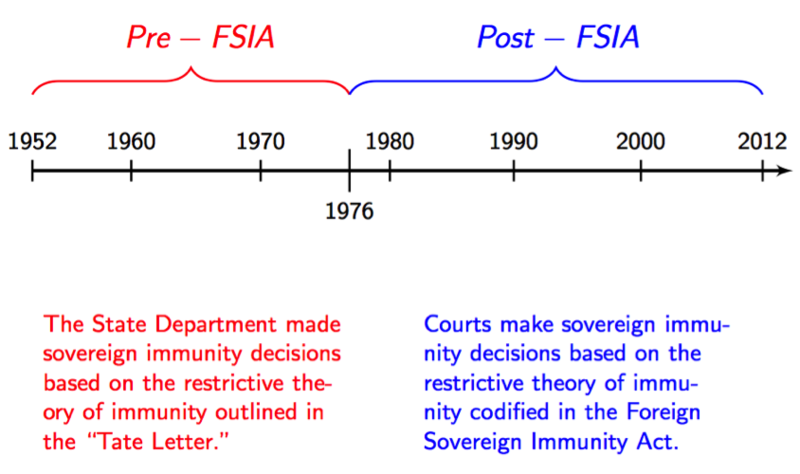 In 1952, however, the United States adopted a new, restrictive theory of when sovereign immunity should be granted. This paved the way for foreign governments to be sued in American courts over their “commercial activities” (like breaking a contract with an airplane manufacture) but not their “public acts” (like passing legislation that limits what kinds of airplanes are allowed to fly in their airspace). Of course, whether any particular action taken by a foreign government constitutes a commercial activity or a public action is not always clear. When suits against foreign governments arose, initially it was the State Department that was forced to make these calls. It was not long though before critics began to argue that the State Department was making politically motivated decisions—for example, that immunity was awarded to important countries even though a specific suit was clearly based on commercial activities that should prevent immunity from being granted. In 1976, Congress responded to these criticisms by moving the authority to make foreign sovereign immunity decision from the State Departments to the courts. To leverage this change in authority, we built a database of immunity decisions made before and after the passage of the FSIA. By controlling for the facts underlying each dispute and the characteristics of the parties involved, we are able gain some traction on how these two different branches of government have made foreign relations decisions. In contrast to previous studies that evaluated a small number of cases qualitatively, our study does not reveal evidence of systematic bias in the State Department’s immunity decisionmaking, while it does identify potential political influences on the courts’ decisionmaking. Although there are admittedly some limitations to our data and approach, these results still challenge the frequently made argument that the State Department is worse at making legal determinations free from political interference than other branches of government. If you want to read more about our method and results, you can find the paper at SSRN. One of the primary questions studied by scholars of international law is whether countries comply with their international legal commitments. For example, scholars study whether countries comply with treaties they have signed that regulate the conduct of war or mandate the protection of human rights. In most of these studies, the focus is on assessing whether the national government of a given country complies with some obligation. Of course, national governments are comprised of many institutions and, depending on the obligation, different institutions must take actions to comply with international law. A topic that has received little attention, however, is how the likelihood that the country will comply with international law is affected by which particular institution is required to take action on behalf of the national government. In a recently published paper, Supplying Compliance: Why and When the United States Complies with WTO Rulings (available here), we argue that when the United States loses trade disputes, the particular domestic institution required to act is an important predictor of whether (and when) the U.S. will comply with the ruling. In fact, it was the most important factor. 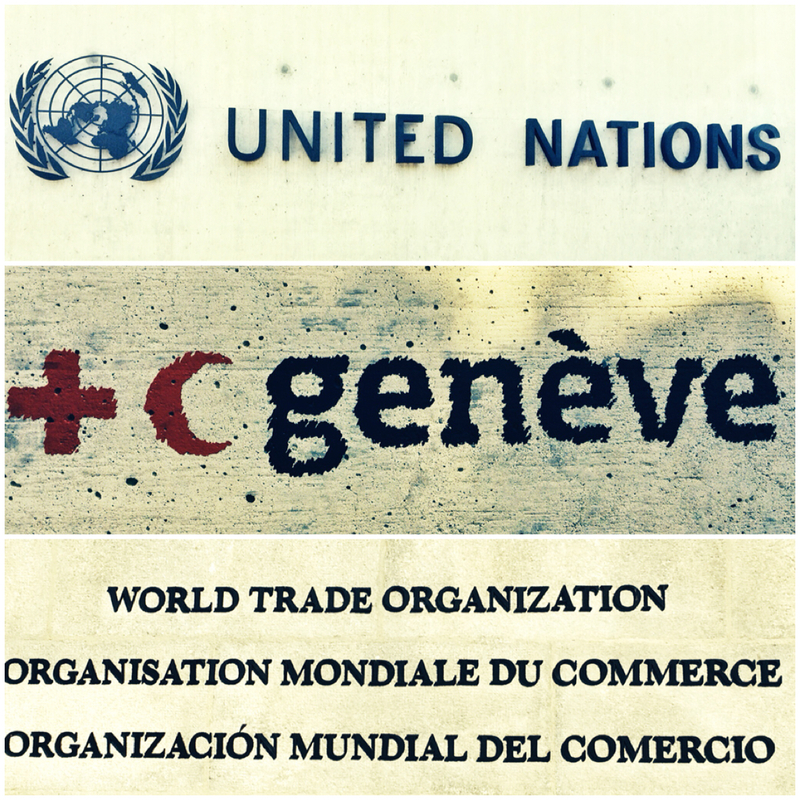 Our paper empirically studies this topic by analyzing compliance with legal challenges brought against the United States at the World Trade Organization (WTO). The WTO allows members to bring disputes against other members that arguably aren’t complying with various trade agreements. Since the WTO was created twenty years ago, countries from around the world have brought over one hundred cases against the United States. In cases that the United States has lost, different branches of government have been required to take act to cure the violations. For example, the President responded to some complaints by issuing executive orders and Congress responded to other complaints by amending sections of the tax code. The dataset we built for our project includes all WTO complaints made against the United States before 2012. For each complaint, we tracked down the policy changes that the United States made after the dispute. We also collected data on the characteristics of the countries that filed the complaints and the topics of the disputes. 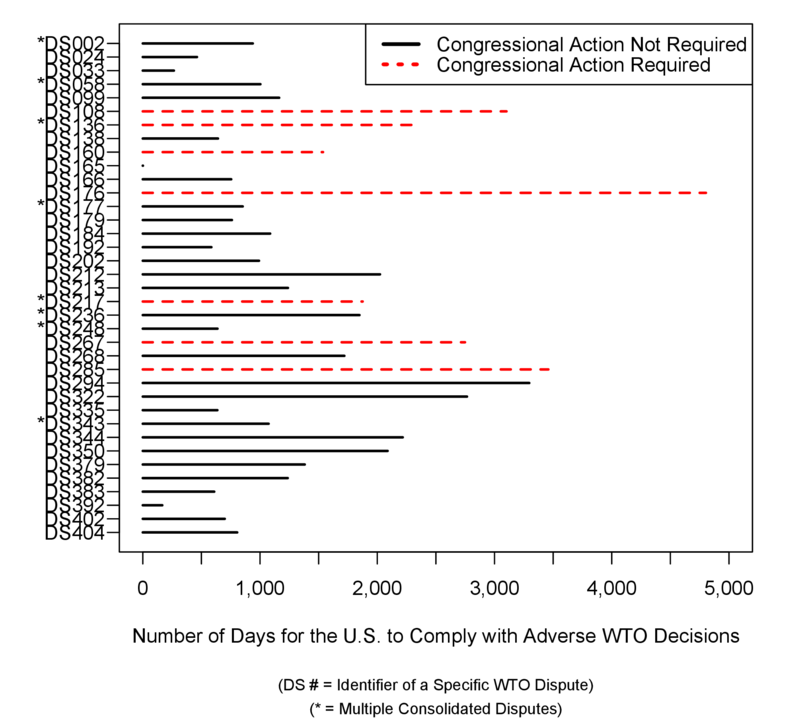 After controlling for a number of variables, we found that the United States was more likely to comply (and to comply more quickly) with a WTO decision when the executive alone could bring the country into compliance than when Congressional action was needed. 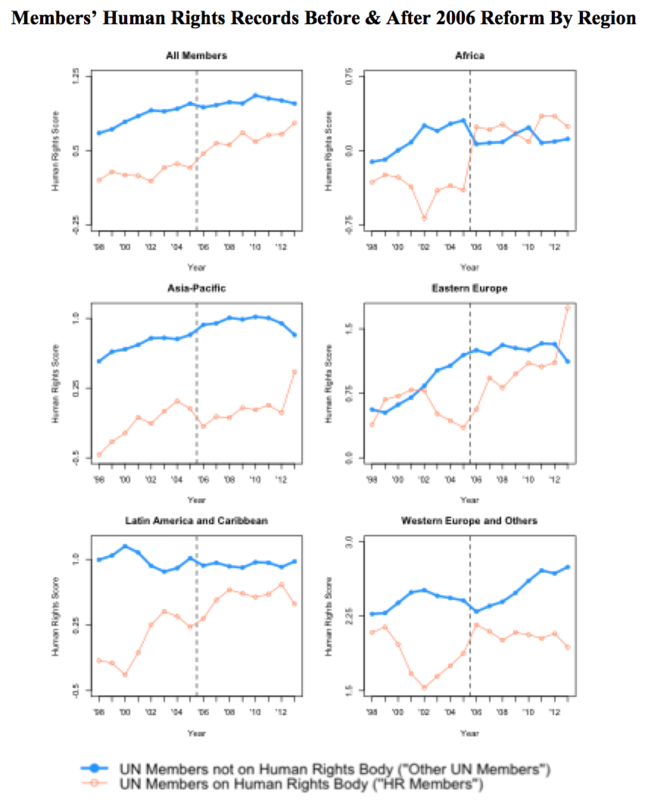 Although there are a number of confounding factors that may influence this result, as well as limits to the generalizability of our findings—both of which we discuss in the paper—we think these results suggest that having a complete understanding of compliance with international law requires paying more attention to the specific domestic institutions that are involved.